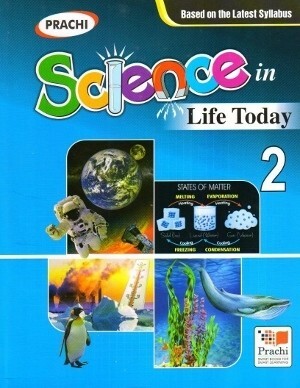 Prachi Science In Life Today book series is based on the latest syllabus as per the National Curriculum Framework 2005. Based on the latest syllabus as per the National Curriculum Framework 2005. Whole content is divided into several Units which are further sub-divided into chapters. Each chapter starts with Lesson Objective, a synopsis of the topics discussed. Simple and easy to understand content with colorful illustrations. Words To Remember and Quick Recall at the end of each chapter for better understanding of the learnt concept. The Exercise part comprises a variety of questions in the form of True or False, Fill in the blanks, Correct the statements, Match the following columns, Answer the following questions. Think and Answer and High Order Thinking Skills (HOTS) type of questions to test the understanding of the students to the minutes details. Value Based Questions and questions based on Problem Solving Assessment are also added in this part. Experimental work is carried out under the heading Activity. It includes Classroom Assignment, Home Assignment, Field Assignment, Group Assignment, Project Work and Classroom Presentation. A set of Test Papers for regular evaluation of the learners. An Additional reading section after each unit comprises interesting information with colourful illustrations under the headings Curiosity Corner, Fun with Science, Amazing Science Fact and Photo Speaks. The column Green Gallery will encourage the young learners to practice eco-friendly activities in their day-to-day life.